Valve will be adding 12 new national currencies to Steam's payment options this year. One of the more challenging things about running an online storefront that crosses borders has to be dealing with all the varying payment methods and currencies that the world's nations bring to the table. That in mind, Valve has announced that it will be taking steps in 2014 to be more inclusive of a variety of world currencies to make it easier for its international customers around to shop and enjoy games through Steam. 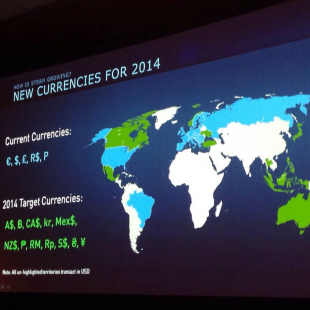 According to a captured presentation slide from Steam Dev Days, the company will be integrating new native currency options to support customers in Australia, New Zealand, Indonesia, The Phillipines, Malaysia, Thailand, Japan, Mexico, Canada, Turkey, Ukraine and Norway. Currently Steam only accepts U.S. dollars, British pounds, Russian rubles, Brazilian reais and euros. We can only imagine that these new currency options are being integrated as a response to Steam's ever-expanding customer base. Just recently, for instance, it was confirmed that the service had accumulated more than 75 million users around the world. What we're wondering is whether or not the listed countries will represent the full extent of the currency additions for 2014, or if Valve perhaps has plans to expand Steam's options to include even more nations than these. We've reached out to Valve for further comment and will offer updates as they become available.